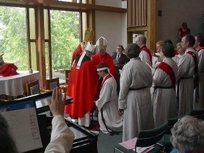 Consecration of +Abbess Jane and +Abbot Andy in 2003. Apostolic Succession is a way of tracing the lineage of a community, through its bishops, back to the early Christian church. It is best thought of as type of genealogy. The following three lines of Apostolic Succession are only a partial sampling of the seventeen lines that tie the Lindisfarne Community to the ancient church. 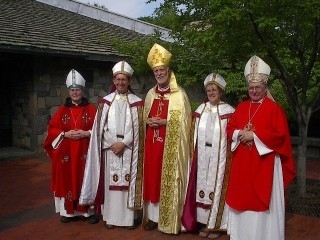 In addition to these, we are included in the Apostolic Succession of the Metropolitan-Archbishops of Albania, the Armenian Catholicate-Patriarchate of Cilicia, Patriarchate of Moscow, Greek Melkite Patriarchate of Antioch, the Catholic-Patriarchate of Assyria, Old Catholic Succession, the Holy Russian Orthodox Synod as well as many others. The first Anglican line that follows is one of three direct Anglican lines the Lindisfarne Community has received. Table of succession of the Patriachate of Antioch showing its western de-velopment. This patriarchate has never ceased to elect and consecrate her own Patriarch and has preserved the Apostolic Succession unbroken. It was the first Gentile Church founded by St. Peter in 35 A.D. according to the Anglo-Saxon Chronicle, and it was here that the followers of Jesus Christ were first called Christians. 1. Peter the Apostle 35 A.D.
Archbishop Metropolitan of all the Orthodox Catholics of the Americas. First Bishop of the African Orthodox Church. as Primate of the American Catholic Orthodox Church, Petrine Antiochian Succession.